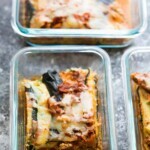 This freezer turkey zucchini noodle lasagna is the perfect gluten-free and low carb meal prep lunch or dinner! 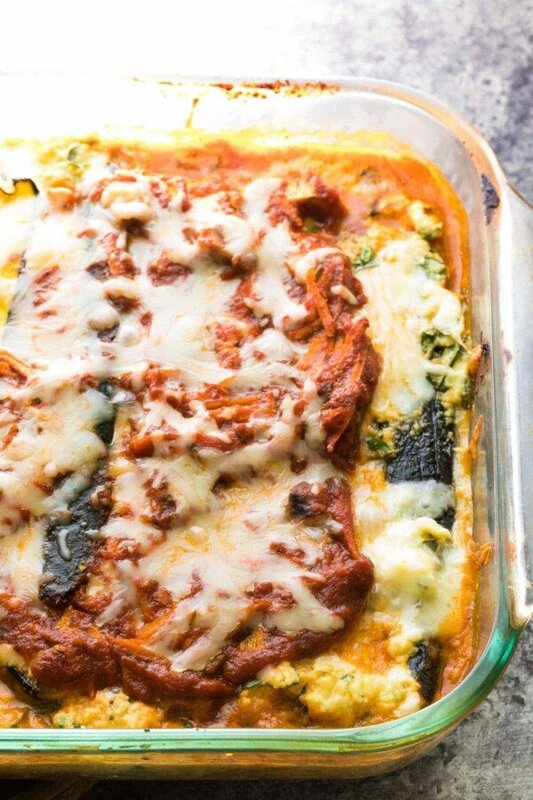 Make it ahead and freeze for when those lasagna cravings hit you. Turkey and vegetarian recipe options included. All I can hear right now is “La-la-sagna” over and over in my head. The other night we were discussing how somehow I know the Weird Al lyrics to certain songs better than the actual lyrics…and that prompted us to listen to Weird Al during dinner, and when “Lasagna” came on (to the tune of La Bamba), we were all hysterically laughing, and now it’s pretty much Kai’s favorite song ever. So now I don’t think La Bamba will ever be the same, and every time I make this turkey zucchini noodle lasagna, I’m going to be singing Weird Al from here on in! I actually wasn’t sure how I should label this lasagna…as a meal prep lunch or a meal prep dinner? It really can fulfill either role. To make this a ridiculously easy meal prep dinner, I assembled all the components and froze it, unbaked. 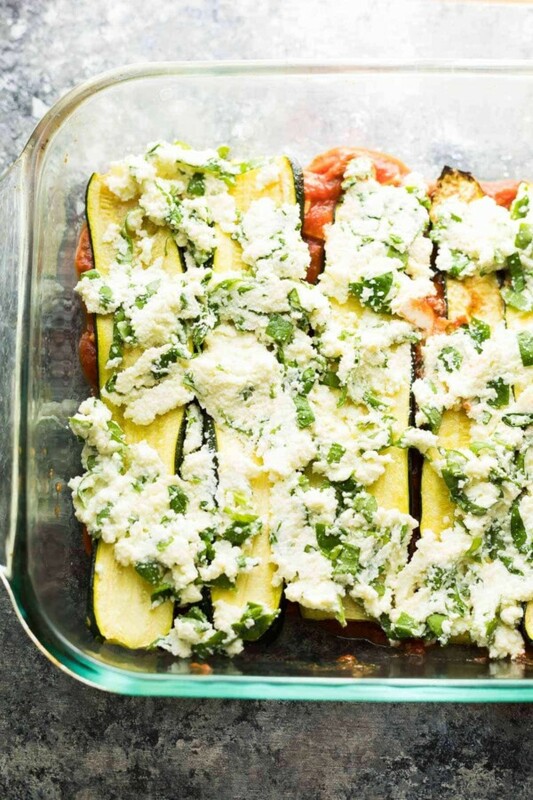 Then, you can toss it in the oven, completely frozen, and bake away for an easy dinner. , and stash in the fridge (short term) or freezer (long term). Re-heat in the microwave for a supremely comforting but surprisingly light meal. 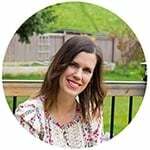 I have been trying to come up with more freezer-friendly meal prep lunch options, because this gives you the freedom to mix up your meals more often, and they can last for so much longer. These Cauliflower Rice Black Bean Burritos are another great freezer-friendly meal prep lunch option. 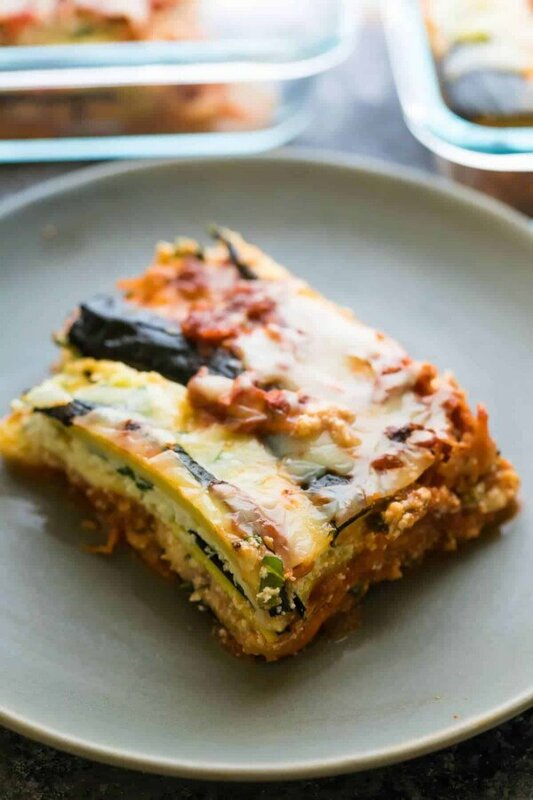 The other thing I wasn’t totally sure about was whether this should be a vegetarian zucchini noodle lasagna or a turkey zucchini noodle lasagna. We actually enjoyed it both ways, but the turkey zucchini noodle lasagna definitely edged out the vegetarian version for a few reasons: 1) it was more satisfying and kept us full for longer and 2) it wasn’t as liquidy. The vegetarian version, (which is what you see pictured here) is a touch liquidy. It didn’t bother us at all, but to make sure you minimize liquid in the lasagna, broil your zucchinis well, drain your ricotta cheese, and drain the pan after cooking your onion/veggie mixture. Ben and I were completely blown away by the fact that we did not at all miss the noodles in this recipe! 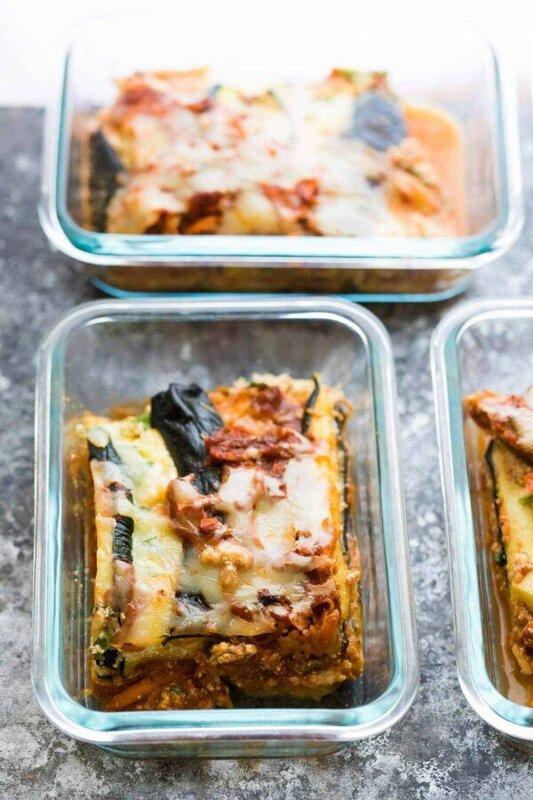 Whether you enjoy the vegetarian version or the ground turkey version of this zucchini noodle lasagna, you are in for a totally delicious, totally healthy, low-carb and veggie packed meal.
. Store in the fridge (up to 4 days) or freezer (up to 3 months; thaw completely before re-heating). Heat in the microwave until heated through. 1/4 teaspoon fennel crushed double it if you love fennel! 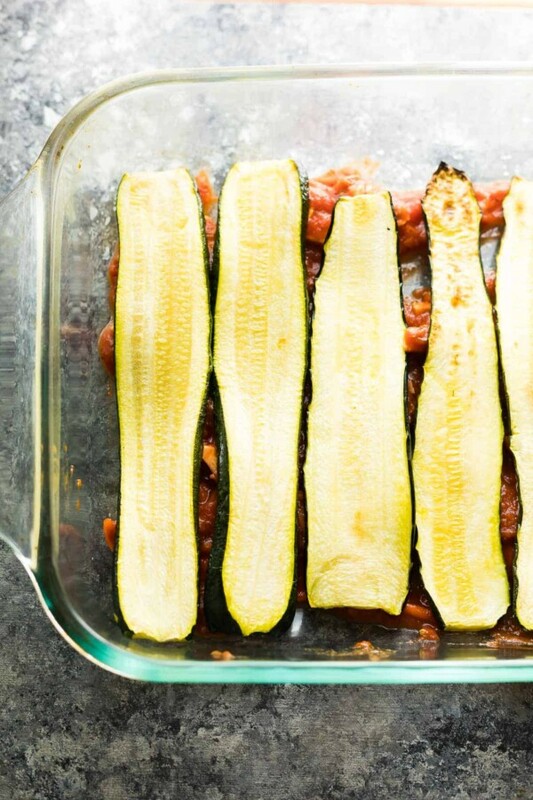 Place a wire rack over a baking sheet and arrange zucchini slices on the rack. (You may need to do this part in 2 batches to fit all of the zucchini slices). Spray both sides of zucchini slices with oil, and broil for 6 minutes per side (turn half-way through), or until lightly browned. Keep an eye on them as all broilers are different and you do not want to burn them! Heat oil in a large non-stick pan over medium heat. Sautee onion for 7 or so minutes, until soft and translucent. Add 2 cloves garlic and cook for 1 more minute. Add lean ground turkey and cook for 10 or so minutes, until cooked through and no pink remains. Drain the pan if necessary. Add the oregano, salt, crushed fennel seeds and pasta sauce, and cook for 2-3 more minutes until warmed through. Stir together the ricotta, egg, salt, spinach and basil in a large bowl. In a 9 X 13 inch baking pan, spread out 1 cup of the tomato sauce. Top with half of the lasagna 'noodles', followed by half of the ricotta mixture, ¾ cup of shredded mozzarella, and half of the remaining sauce. Repeat, finishing with the tomato sauce. Bake uncovered at 375°F for 20 minutes, spread with the remaining ½ cup mozzarella, and return to the oven for 10 more minutes. Allow lasagna to stand for 10-15 minutes before serving (this helps it set up). Assemble lasagna as directed above, then cover with foil. Freeze for up to 3 months. To bake from frozen, pre-heat oven to 375°F. Bake (covered) for 45 minutes. Remove foil, and bake for 15 more minutes, until cheese is bubbly and lasagna is heated through. IMPORTANT Avoid freezing lasagna in a glass dish (including pyrex) as extreme temperature shifts (such as placing a frozen lasagna into a hot oven) can lead to explosions or shattering. I used a metal baking dish. Swap the ground turkey for 1 cup shredded carrots and 1.5 cup chopped mushrooms. Cook the veggies with the onion and drain any liquid from the pan before adding the tomato sauce. This recipe is fantastic! It’s a great way to cut back on the carbs! So happy you liked it, Christa! I made this tonight and it was super delish! You’re right, you can’t even tell that it doesn’t have noodles. I broiled my zucchini for longer than 6 minutes per/ side though as they seemed to need it (more like 8-9 mins/ side).. And, if anyone is on weight watchers, it is only 6 Freestyle points per serving. Thanks for the great recipe! Will definitely make this again! 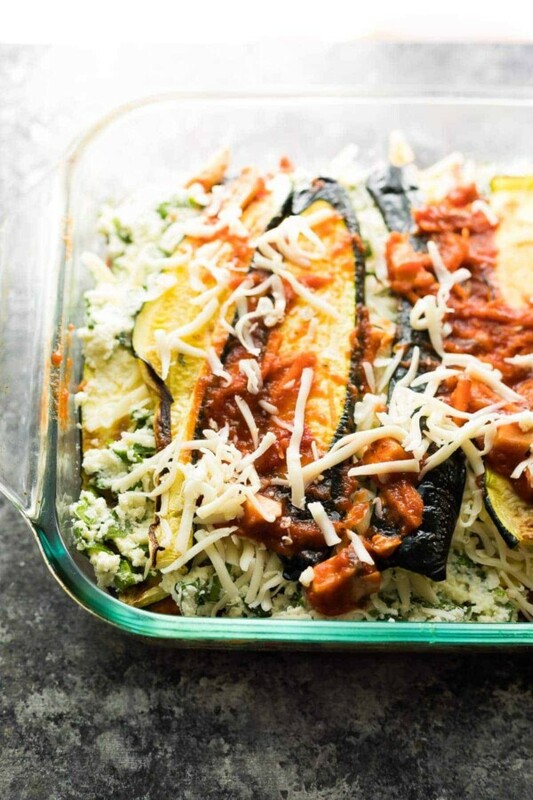 Ugh, this lasagna is BEYOND gorgeous, Denise! 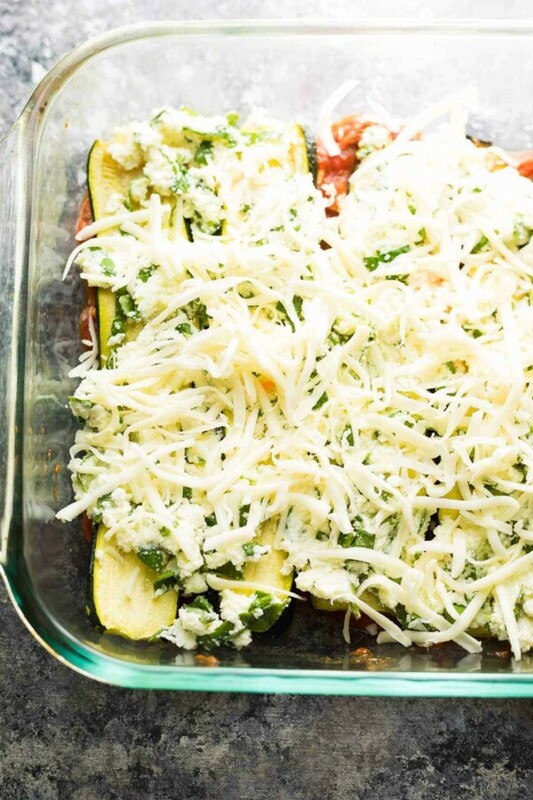 I’ve never made a lasagna with zucchini noodles before so this one is DEFINITELY going on the dinner menu asap!